Discussing your salary during any interview is probably not the easiest thing in the world but that also doesn’t mean it is impossible. You can surely discuss it in the right way and get the salary that you have always wanted, provided that you follow some of our tips and suggestions. In this post, we have enlisted some really great and effective ideas that will help you get the job offer you desired. So go ahead and give this post a good read! 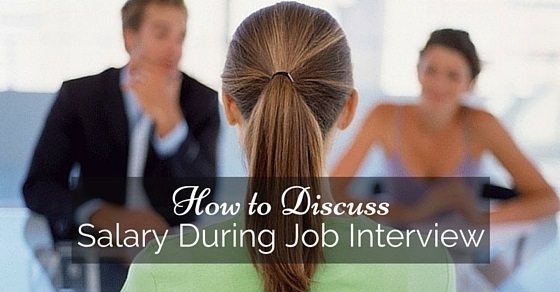 The old school method is quite simple and needs to be done when the interview is coming to an end. During this period the hiring manager already knows as to whether you are a good fit for this job or if you aren’t. In this situation you will be greeted with a nod and a smile and then they will tell you that initially you will be given this amount after which your salary will be raised depending upon the review of your performance. If you are very lucky, they will be offering you exactly what you wanted but if that is not the case, then you need to apply the old school method. How to go about the old school method? The old school method can surely become successful if you know how to go about it. You really don’t need to have much experience for this. As far as you do what has been told to do in these paragraphs, you will surely become successful. Also remember that in order to land things like these you need to be confident in your skills and do what makes you most happy and comfortable. You should just never go for something that is given to you. After all, the interview process is long and at the end if you find out you havent landed anything, you will be the most upset. Therefore, we think you should make it very clear from the start about what you are looking for and what you expect to receive from this one! The new school method is all about having the skills and the confidence that will carry you through the candidate. You should know how to carry yourself in everything that you do and that also includes how much you are worth. Liz Ryan who happens to be expert in the HR world and who happens to know everything related to job hunting has spoke about an executive mindset which could act as a switch between imagining that you are looking for a job and someone who is a professional and is currently hoping for a new assignment. Instead of being the individual who is happy about being given the job, you need to be someone who is eager about going onboard. First of all, you have to make sure there is some sort of confidence in you. Plus you have to be very honest right from the start. If you keep blowing up that ego of yours and swagger yourself into the interview with very little confidence then you will not be getting the job of your dreams. So it is very important to handle your own level of confidence. Just make sure that, you are very much in charge of that interview. All you must do is make sure that you are showing the kind of confidence you are looking for and one that will convince you. Of course this needs some kind of strategy and it all begins with knowing yourself. How important is your confidence? Never make the mistake of waiting right towards the end because by then it will be way too late. The following points will help you know the importance of confidence. You should show that you are pretty damn professional, polished and very polite by using simple words such as thank you but you should immediately follow it up with a question to see whether you really have been offered the job or not. 2. Are things like this negotiable? Once you have been offered the salary, it will never really hurt if you ask them if they will put some more money on the table or is there a chance of salary negotiation. If they happen to say no, you should move on in order to negotiate with a few other items. 3. Ask whether this is only the base? You should ask if the figure that you have been offered happens to be the entire compensation. This will obviously let the person who is interviewing know about the details of what you are expecting as a bonus along with the options of the stock and in that way it will open up to some other questions and maybe some other opportunities. You should never accept a job offer right way. In the society that we live, people are always understood as more thoughtful when they take some time to think. Plus when you are taking some time off to think, you should go through your negotiation strategy. You can instead say that it is a great job and that you really want to do it, but since given the experience that you have, you are better off on your own. You should never say that have to discuss the things with your spouse and if you really want to come across as confident and much capable, you should make a decision by yourself. 5. Ask if you will be given the offer in a piece of paper? You should never accept an offer unless it has been given to you in a piece of paper because most people are not honest. If you end up quitting a job on the basis of some verbal promise of a job that has been handed over to you recently, there are chances you will have no job and probably no recourse at all. If the answer to this question is a no, then you should say okay and that you were only asking. Only because negotiating a salary of the job is not possible, it doesn’t mean that the aspects can’t be negotiated. You should ask for some flex time and some telecommunicating or something else that you think is important. Now this could be a way to show that the offer you are being given is no joke. Several people would want you to start right away but they will be very much disappointed if you also agree to do the same. In case you leave your current employer hanging in the air, they might think that you will do the same thing to their company when the time comes. So if you are thinking of changing some jobs, then we think you should definitely take some time and get off the job you have to start off with something else. This question is also a must and should be asked there itself during the interview. The question will not just verify the job but also help you understand whether you are capable of finishing this or not. Now these questions will always separate whether you shall be evaluated and in case you are eligible for some raise. Such two questions are very much linked and may help you understand whether the question is negotiable. No matter what, never make the mistake of lying to them. After all, they will get to know sooner or later. All you need to do in cases is be honest. If you lie, you will look stupid and ultimately lose all your chances of screwing it up in the future and I bet you really don’t want to do that. When you are asking a question, always remember to be polite and kind. Never ask silly questions. You should be making an impression that is good. In fact they should be happy with your response. So when you are negotiating a salary or even talking about your salary, try to be as nice and sweet as possible but don’t you ever come across as rude. What we mean to say is maintain yourself and the way you speak. If you want to get a good salary, you should always mention the experiences you have had in the past. People will only be convinced to give you a good salary if you prove it to them that you are absolutely worth it. In that way, you will have a bigger chance of getting the salary expectation you had and hopefully, you will not have to negotiate for it . Now doesn’t that seem like a smart thing to do? When you are given a form to be filled out before the interview, make sure to mention all the right details. That is a must. You should give all the correct numbers, write down your past experiences and make it look neat. Most importantly it should be true. Plus if you have got any incentives in the past or some bonuses, you should mention them as well. Medical reimbursements and commissions must also be added alongside so that they can understand you better. Always remember that no matter what job you are applying for, you cannot use your salary negotiation tactics for every job offer or will not be able to negotiate with every salary. An example can be used to explain this. There are several entry-level jobs which come with a good starting salary. There are some industries which have a follow-up mantra as well. If that happens to be the case for this kind of position that you could be interviewing for, please do not come around and straight away throw your negotiation skills. After all, you are there to get the job and not to make money out of them. In that way you should be understanding. By using these ideas and salary negotiation tips, you will surely be able to get the salary range you have always wanted, even if it is a job interview. Apart from following the methods we told you, you must also ask the right questions we have discussed above. That will help you understand how to negotiate and make the right choice. Not only that, you will also be making a very good impression in front of them. So go ahead and try your luck! And in case you have some feedback to give regarding this post, please feel free to comment in the box below. Also we love hearing your questions, don’t forget to post them either. On that note, good luck!